Small marks (photographed) around the base. CONTAINS 1 ROBE, SASH, HAT, CROSS NECKLACE AND CAPE. FABRIC IS EASY CARE 100% POLYESTER. 38 TO 40" CHEST. Cream, Robe, Sash, Hat, Necklace and Cape. We will always strive to solve any issues you may have. 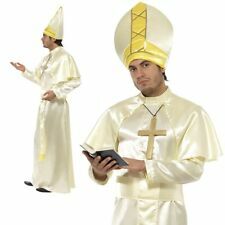 Men's Pope Costume Description Men's Pope Fancy Dress Costume consists of a superb quality White Tunic Robe With Gold Trimming, Plus Hat and Belt Size Available in Standard size up to 48" Chest An Ideal Costume for any Themed Fancy Dress Party, Dress Up or Photo Opportunity. Young Male. You may use the model cancellation form at the end of these instructions, but it is not obligatory. Image Gallery. B Model Cancellation Form. Right to cancel. TEEN 13 34 - 36 86 - 91 29½ - 31½ 75 - 80 32¼ 82. Includes robe with attached tabard and hat. Robe, Belt. Chest Upto 44. 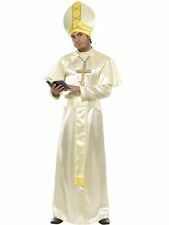 Men's cardinal fancy dress costume Includes robe & belt Ideal for religious themed fancy dress parties Colour: White with gold detail Size: Fits up to 44" chest . Cardinal Costume Black with Robe Mock Belt Hat & Cross Necklace . Costume cardinal Noir avec Robe Ceinture simulacre Chapeau et collier croisé . Includes - Long white robe and headpiece . CONTENTS INCLUDED: Mitre Hat Bishop Pope. Dress includes: full length robe with gold trim and sash belt, Headpiece. Shoes and cross not included. AC643 - POPE. Pope Costume Cream Robe Sash Hat Necklace and Cape . Robe, Hat. Once an unpaid item case is opened, it cannot be closed. There may be cases where it takes longer. Helpful Links. Iron Man Mask Light Up Eyes Avengers Movie Superhero Fancy Dress Party. ALLERGY WARNING: If you are allergic to latex, do not wear. ONE SIZE FITS MOST ADULT MALES UP TO 6'. UV Glow Neon Hair Paint Streaks Mascara (6 Colours Available). POPE COSTUME ADULT (M) UK 40/42" Costume Fancy Dress Brand New .